The Pakistanis were in a belligerent mood under General Yahya Khan. Pakistan did not want to play with India, it wanted to fight. The bone of contention was the struggle of the poor people of East Pakistan against Pakistani oppression. An Indian Airlines aircraft was hijacked to Lahore airport, where it was burnt. A war to liberate Bangladesh was inevitable. n 1971, I was called for the selection trials for the Indian team for the inaugural World Cup hockey tournament in Lahore. The camp was held at the National Institute of Sports, housed in the Motibagh Palace in Patiala. Roop Singh, who had earlier selected me in the All-India Schools team, and Babu, were on the Selection Committee. I was selected in the team to tour Pakistan, but destiny decided otherwise. The Pakistanis were in a belligerent mood under General Yahya Khan. The Pakistani cricketer Abdul Hafeez Kardar led a campaign against India's participation in the hockey World Cup. The Pakistanis did not want to play with the Indians, they wanted to fight. The bone of contention was the struggle of the poor people of East Pakistan against Pakistani oppression. The Bengalis were asking for a homeland of their own under Sheikh Mujibur Rehman. Pakistan felt that India was helping the Bangladesh revolution. An Indian Airlines Fokker Friendship aircraft on a flight from Srinagar to Jammu was hijacked to Lahore airport, where it was burnt. A war to liberate Bangladesh was inevitable. 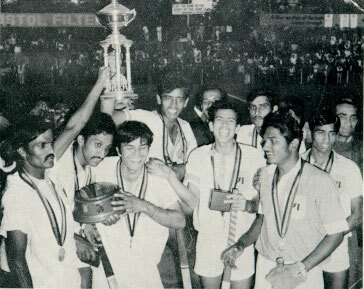 During this tense period, Indian Airlines participated in the Jawaharlal Nehru hockey tournament in Delhi. We reached the final, where our opponent was a team from Britain. The first half of the final was barren. In the second half, Indian Airlines had already scored two goals when suddenly air raid sirens blared, signalling a possible Pakistani attack. In all our excitement of playing and winning tournaments that year, this was the first time we felt and understood the seriousness of the situation. A few days after Inam-ur-Rehman had scored two goals in the final to lift the Nehru trophy for Indian Airlines, Sheikh Mujibur Rehman's people achieved their goal of a homeland of their own.